Even the earliest cynodonts, the Procynosuchidae of the Late Permian, show many advanced mammalian characteristics, such as a reduced number of bones in the lower jaw, a secondary bony palate and a complex pattern of the crowns of their cheek teeth. It is likely that Cynodonts were at least partially if not completely warm-blooded, covered with hair, which would have insulated them and helped to maintain a high body temperature. In the end, the small advanced cynodonts and their mammalian descendents became nocturnal, depending on hearing and smell and leaving the day to the visual-orientated archosaurs. Cynodont and early mammalian brains were larger than sauropsid (reptilian) brains not because they were more intelligent, but because of the enlarged olfactory and auditory bulbs. The small cynodonts and Mesozoic mammals owned the cool night, or lived in trees, the large thecodonts and dinosaurs ruled the day and the ground. It was to be some 150 million years before a combination of environmental stress and cometary or asteroid impact brought about the end of the dinosaurs and the other great reptiles, and allowed the mammals to emerge and take control of the Earth. The cynodonts are a very well-known and intensely studied volume of phylospace. In particular, a series of interdependent changes in the cynodont head -- mostly soft tissue changes -- has been the focus of much science and not a little inspired speculation. The principle issues are a) the development of the characteristic mammalian jaw musculature and jaw articulation (b) the enlargement of the brain (c) the evolution of the mammalian middle ear, and (d) the beginnings of the unique mammalian feeding style and molar dentition. This is far too much to swallow all at one bite, even for well-educated hominids with all of the aforesaid brain, jaw, ear and dental equipment. Palaeos is an ambitious project, and we have not shied away from some reasonably technical matters. However, any attempt to integrate all of these issues at once would decisively cross the line between ambition and hubris. Of these four transformations, the change in jaw musculature may have been the most advanced at the end of the Permian. Accordingly, as a first iteration, we will outline the changes in jaw musculature and note how those developments may have related to some of the others on our list. As Rowe (1996) points out, the early cynodonts were the first synapsids in which the brain filled the endocranial cavity. This is, perhaps, not the most impressive of accomplishments because the cynodonts were, quite literally, narrow-minded. That is, the brain was a long, tube-like affair (notably priapiform, in fact) trapped within a very narrow skull. However, precisely because space was limited, any further expansion of the brain required remodeling the skull -- a constraint which had profound consequences for both the structure of the ear and the location of the jaw muscles. All three of these structures -- brain, jaw muscles and ear -- compete for space at the back of the head. This is particularly true of the brain and jaw muscles since both are made up of a single basic type of cell and the power of both is, roughly speaking, a linear function of the number of cells. In more basal therapsids, the jaw was closed reptile-fashion, by the adductor mandibularis, which originated on the braincase. The bulk of the muscle mass was located in an adductor chamber between the braincase and the dermal skull bones. The adductor mandibularis inserted on the coronoid process and internal surface of the lower jaw. Fenestration of the temporal area of the skull allowed more room for muscle mass. However, even the earliest cynodonts had taken this trend just about as far as it could go. 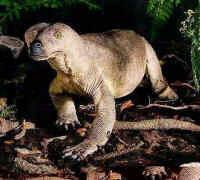 One crucial change seems to have occurred in the precynodont therapsid lineage. In order to make more room for the adductor, the bar under the temporal fenestra (jugal + squamosal) became more robust and moved laterally, bowing out from the side of the skull. By itself, this development might have left the braincase overly exposed, but the parietal grew down and covered the braincase laterally. Thus, the attachment area for the adductor was both changed and split. The point is extremely important for later developments, and -- at the risk of beating a dead horse -- worth doing one more time, with feeling, and in more rigorous detail. See, generally, Carroll 1988). FIRST In the old adductor chamber, the adductor attached to the inner surface of the parietal (which roofed the chamber) and to the braincase. In Thrinaxodon, this is geometrically impossible. Instead, the adductor attaches to the outside surface of the parietal, which covers the braincase. Thus the braincase no longer need be engineered to support muscle. There is also more room to expand. In this configuration, expansion of the braincase will actually increase the surface area available for muscle attachment, if some of the muscle body can be moved out of the way. SECOND Expansion of the old subtemporal bar into a laterally flared zygomatic arch does exactly that, and more. Not only does it open up the space for muscle mass, but it creates a whole new surface for muscle attachment. The old adductor mandibulae therefore splits. The portion attaching to the external surface of the parietal is now referred to as the temporalis. The portion attaching to the inside surface of the zygomatic arch is referred to as the masseter. The temporalis attaches generally to the coronoid process and medial jaw, as before. But the masseter is not only posterodorsal to the jaw, it is also lateral. It attaches to the outside or lateral surface of the coronoid process. This creates an entirely new level of jaw control. Since we now have adductor muscles on both sides of the lower jaw, it becomes possible to develop controlled, lateral grinding movements. The final step, taken by the late cynodonts, is illustrated in the figure of Probainognathus. Here, the masseter itself has split, with part moving anteriorly to originate on the anterior portion of the zygomatic arch, under the orbit and attach on the posterior end of the jaw. Now, we also have opposing adductors anterior and posterior, allowing front-to-back as well as side-to-side grinding. With this complete set of muscles, it becomes possible to make controlled grinding movements of the jaw in any direction. Since these are all adductor muscles, this can all be done while the jaw is closed. Given this level of fine control, it became possible, and advantageous, to evolve teeth with fixed and definite patterns of cusps. That is to say, all of this muscle reorganization set the stage for the waves of dental specialization which characterized the mammal lineage, as well as the expansion of the brain. As Crompton & Parker (1978) point out, this suite of muscles also permits the animal to generate impressive jaw forces on the teeth without generating much pressure at all on the jaw joint. In fact, given the hypertrophied muscles developed by the cynodonts, the jaw joint becomes almost irrelevant. These jaws were not designed to slice or cut using the momentum of a rapidly closing hinge joint. Rather, the cynodont jaw was optimized to shear, tear and grind by lateral movement after the mouth was already closed. The jaw, as such, needed only to be fast enough to work around an appropriate food item. Depending on diet, this might not require a hinge joint at all. Accordingly, the reconstruction of the cynodont jaw muscles also freed up the post-dentary bones to be exapted for other uses, such as hearing, and permitted a gradual shift of the joint to a more mechanically advantageous articulation between the dentary and squamosal. Conversely, with opposing sets of muscles actin on the jaw at various points, it would be disadvantageous to divide the structure of the mandible among several bones. This could easily result in the jaw ripping itself apart. Thus the development of the dentary as the only bone in the lower jaw, to the exclusion of all other mandibular bones, can also be understood in terms of the structure of the jaw muscles. But, to return to our starting point, one should not take this sort of simplistic analysis too seriously. Had we started with an analysis of brain expansion or dentition, we might have been able to make a similar case, creating the impression that these innovations drove all of the others. We can understand the various systemic changes in terms of their relationships with jaw musculature, but we should not confuse this understanding with actual causation. It is not even clear that "causation" is a meaningful concept when applied to co-evolving and interrelated systems of this sort. Rather, in focusing on jaw muscles, we have simply chosen a convenient point of view from which to observe certain points of a smooth series of state changes. ATW030214. Notes:  Kemp (1982) suggests that the brain may have been much deeper, hence larger, than is usually supposed. Image: (model) the Hammond reconstruction of Procynosuchus. References: Barghusen (1968); Carroll 1988); Crompton & Parker 1978); Kemp (1982); Rowe (1996).